Rowenas Tea Room - Our Favorite Place for Girl's Day Out Tea! Rowenas Tea Room has unfortunately closed its doors forever-- a depressing thought since it used to be our favorite spot for our annual Girl's Day Out pilgrimage. 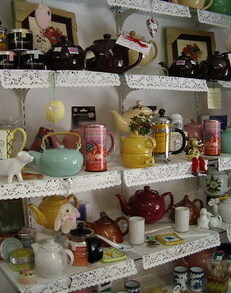 Rowena's in Historic Ghent, VA, has every teapot imaginable. When she was younger, our daughter Stephanie used to say, "I like it because it's a tea place and I get to feel grown up and have a tea party. It's almost like a girl's club!" From the moment you walk in the door of Rowenas Tea Room, you know you're in for a wonderful, memorable tea party. The front two rooms of this quaint little shop are filled with every type of tea paraphenalia imaginable-- tea, tea pots, tea cosies, tea strainers, tea towels, aprons and more. Then there are Rowena's beautifully wrapped jams, jellies, spreads, and poundcakes, and our favorite-- bite-sized samples of all their poundcake flavors (the hard part is not eating too many before going in for tea!). IF you can make it past the front rooms without killing your wallet or your appetite (and if you have reservations; more on that below), one of Rowena's lovely assistants will take you to the next event: Rowenas Tea Room. I like the almond and lemon poundcakes, as well as the Double Delicious Chocolate cake. Her Lemon Curd sauce reminds me of the kind my mom used to buy when we were in England. And the Spicy Peanut Sauce is piquant, with just the right touch of ginger...perfect for dipping cruidites or to compliment Asian dishes. Rowena's Tea Room in Norfolk, VA, is a delicious spot. So lovely. So relaxing. It's a small room, but the hand-painted murals of flowers, gardens and latticework, plus the elegantly set tables, set the mood for your special Girl time tea party. Luncheon Tea - "A delicious balance of flavor on a two-tiered silver tray." Assorted tea sandwiches (they vary, and include things like chicken salad on delicate endive leaves, salmon sandwiches...yes, with the crusts cut off); scones that melt in your mouth; a selection of pound cake slivers; fruit; and a pot of tea. Our kids still love the Children's Tea (the ultimate mini tea party). Peanut butter and jam sandwich (no crusts, of course); grilled cheese and turkey sandwiches (just the right size); pretzel rods; carrots and ranch dressing; cookies and gummy treats; fresh fruit, beautifully prepared and arranged; and tea or apple juice (ask for it to be served in a child-sized tea cup). 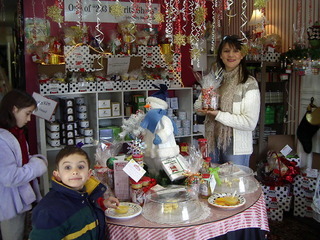 Tea Room hours are Thursday, Friday, and Saturday, 11:00 to 4:00 (the Tea Room is closed in December). Reservations are requested. They also do tours for school classes and homeschoolers. Tea Room address: 758 West 22nd Street in the historic Ghent section of Norfolk. Tea Room phone number: 757-627-8699 (call for reservations). Click here for a Rowenas Tea Room Google map. Rowena's creations have become so well known that she has a thriving mail order business for birthdays, special events, a home tea party, and holidays. If you're looking for the perfect cake for your Red Hat event or tea party, Rowena's has a delicious Almond Cake in the shape of a red hat with purple and red roses. Serves 20-25. To place an order or get a catalog, call 800-627-8699 or go to www.rowenas.com.